Yesterday, I reviewed Big Brother by Lionel Shriver. Here are my notes from a Q&A with Shriver about Big Brother that I attended last month at Politics & Prose here in DC. I hope this helps provide more color around Big Brother – I certainly found that it did. This is a book about a sibling relationship – an intense relationship together as children that bonded them. Pandora wants for herself the wholesome solidity she identified with her father’s parents in Iowa, where the book is set. She likes modesty and authenticity. Edison is competitive with their father, and wants to see his name in lights, make a name in the world. There is a different trajectory for these two. Edison is handsome, but has now fallen on hard times. Pandora, on the other hand, became accidentally successful. Career success is a running theme in the book, as is obesity. This is a book that looks at the larger issue of appetite. Career success and food themes come together. In the book, Pandora concludes, “we are meant to be hungry”, and that the state of satiety is not to be envied. Desires give us a sense of direction and energy, a place to go toward. When you have you what you want, life becomes a static experience. Success is an absence of pain, but it’s pleasant and mild. “Suffering, though, has an intensity that contentment doesn’t. Sometimes I miss the drive that the other gave me.” As far as being successful, Shriver is “doomed to consider myself very lucky”. The small sacrifice that having a higher profile has brought: attention has shifted from the book and her brother (whom the book is loosely about) to her. Book reviews talk about her diet and her exercise routine. This has illustrated what the book is about: the excessive importance we place on physical size. We’ve gone existentially backwards. The observations on people’s size has become “a sick spectator sport”. She was exposed to it for weeks. Q: Why make your home in London? Most of your books are set in the U.S.
A: I was living in Belfast, and was going to spend one year there and instead spent 12. My partner there got a job in London, and I owed him, so we moved. We split up, but I have career reasons to be in London – a large readership, and I am better known there. I’ve been in the U.K. for 26 years. It has become a big part of my identity. I do think about what it would be like to move back to the U.S. – it would be relaxing but would cause an identity crisis. Q: This book is deeply personal and different from your other books. A: Not exceptionally so. There is usually some personal element that has drawn me to a topic. I lost my brother [to obesity], so it makes sense that this book would come now. But I am not an autobiographical writer. I find that when I am forthcoming, I get the “autobiographical” tag thrown in my face. Especially with female writers – the term is meant to be diminishing, like you can’t make stuff up. With Big Brother, it helped to have something to work through. With So Much For That, I had lost my closest friend to the disease in the book, and was contending with my own mortality. Fiction can combine abstract/social issues with something personal and close to home. It is the illustration of the minutiae of an issue. Q: Has writing books gotten easier? A: Writing books hasn’t gotten any easier, which seems unfair. I had no confidence in this book for its entirety. I only decided I liked it at the final draft. It was very anxious-making. Q: Why did you change your name at 15 years old? A: I hated it; it wasn’t the right name for me. I am glad I did it when I did. The longer you put it off, the harder it is. Q: What did you learn about out-of-control appetite? Did writing the book give you any understanding into our celeb-obsessed culture? A: We turn to food to satisfy other appetites that food can’t satisfy. If you’re eating because you’re lonely, you can eat the whole fridge and you will still be lonely. “Comfort eating” is a weird expression. You won’t feel better at the end – eating comfort food generally makes you feel dumpy and irritated with yourself. As for celeb-obsessed culture: Why don’t young people have more ambition to achieve, or make something? We have blurred career success and celebrity. Why is it interesting or exciting to get a picture in a magazine? I think it has to do with the prevalence of visual images. I deliberately made Pandora, the narrator of Big Brother, a little overweight. It is important that she has her own food issues. She is able to speak candidly, and get a little further under the surface. Lionel Shriver’s latest novel, Big Brother, is an Issue Novel, like her last one, So Much For That, which took on the health care system. In Big Brother, Shriver takes on obesity from a lot of angles – what causes the urge to overeat, how the non-obese see the obese, the impact obesity has on those watching from the sidelines. The main characters are Pandora and her brother Edison, who has ballooned from 163 to over 300 pounds. When he comes for a visit from NY to her home in Iowa, she hasn’t seen him in four years, and is horrified by his altered appearance. Big Brother is about how the two relate to each other and the lengths to which Pandora will – and won’t – go to help him. What responsibility do we owe to a sibling in despair? There’s a lot to like in Big Brother: Shriver’s brilliant-as-always writing; her perspective, which is thoughtful and unique as always; her honesty and willingness to delve into issues many of us don’t want to read about or discuss; her memorable characters. This isn’t a feel-good book, nor did I find it to be a page-turner, but it was a compelling read. (It IS a Lionel Shriver book, after all.) Like in So Much For That, I got the sense reading Big Brother that Shriver had an agenda, an issue, that she wrote a book around, rather than a story that erupted into a novel. And then there’s the ending. I won’t get into it here to avoid spoilers, but there was a typical Shriver-ian twist that put the whole book into a different light. It is sure to alienate some readers, and I was certainly taken aback by it, but for me it ultimately didn’t detract from what the novel was trying to do. 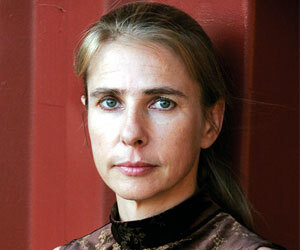 I went to a Q&A with Lionel Shriver last month where she delved into her motivations for writing Big Brother. I will post the Q&A tomorrow – definitely worth a read if you want to learn more about this book. I recommend this one with the caveats above. Know what you’re getting into, and beware the ending, and you won’t be disappointed.